Mastodon is a band that needs no introduction; they are on the shortlist of bands that have influenced and defined the genre thus far in the 21st Century. Since their crushing debut Remission in 2002, the quartet has released five more albums, including back-to-back-to-back classics in Leviathan, Blood Mountain, and Crack the Skye, before falling back to earth and releasing two intermittently enjoyable, but really only ok to good albums in The Hunter and Once More 'Round the Sun. Mastodon's rapid ascent to the top of Critical Reception Mountain early in their career has only made their two-album slide all the more questioned: Were they trying to be more accessible and get a radio hit? Were they burnt out? Does Brent Hinds really hate playing in a metal band? Did they really just fluke their way into three All-Time albums? Fair or not, their seventh album, Emperor of Sand, feels like a make or break album for the band, one that will either return them to metal prominence as a great band, or seal their fate as a good band that had a transcendent six years once. So, you know, no pressure. ...and then "Show Yourself" kills the momentum dead in its tracks. "Show Yourself" begins from a dead stop with a poppy chorus, and while the song eventually finds its way, it doesn't build off of "Sultan's Curse" and it also ends just as abruptly as it begins, so that third track "Precious Stones" also feels like its an album opener (and despite the killer solo toward the end, it's not as good as "Sultan's Curse.") So Emperor of Sand struggles a bit out of the gate. "Steambreather" corrects this stumble in a big way, launching Dailor's vocals over a deceptively simple riff, before completely exploding into a Blood Mountain-esque driving guitar passage at the end. One of Emperor of Sand's greatest strengths is the way it harnesses the best parts of previous Mastodon albums into a refined sound that is at once devastatingly powerful, rawly emotional, and occasionally progged-out wonkiness. "Steambreather" is really the first track on the album to showcase this, but it's hardly the last. "Roots Remain" is not only the album's standout, it's a contender for the best song Mastodon has written. Starting with some spacey noises, it quickly moves into a forceful gallop, with Troy Sanders bellowing over the riff that slows down for the chorus, over which Dailor goes absolutely nuts. His vocal performance is so full of passion and emotion, and he just soars. By the time he gets to the bridge - which also contains some of the best lyrics of his career - he sounds emotionally drained, and it gives "Roots Remain" all the more power. Then ending, a swirling mix of crashing drums and Crack the Skye's ethereal guitar solos brings it all home, before fading out to a beautiful piano melody that's just the icing on the cake. Emperor of Sand marks Mastodon's return to concept albums, and much like Crack the Skye, it deals with a heavy topic: cancer. Leading up to the recording of the album, Brann Dailor's mother was in treatment for cancer, Troy Sanders' wife was diagnosed with breast cancer, and Bill Kelliher's mother died after having a brain tumor. The pain, suffering, and existential questioning the band members undoubtedly were going through comes through on the record in spades, making Emperor of Sand an emotionally difficult album to listen to at times. But even with the heavy subject matter at hand, the return to a concept album benefits Mastodon to an extraordinary degree. 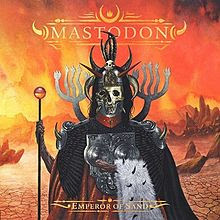 Their three classic albums are all conceptual records, and with Emperor of Sand, I think it's clear that Mastodon thrives when writing songs that exist within the same story. Even with the false starts of the first three tracks, all of the songs on Emperor of Sand clearly belong together on this album. The rest of the album follows the pattern established by "Steambreather" and "Roots Remain:" heavy riffs, impossibly catchy and cathartic vocals, and the occasional bit of proggy wandering. Unlike their two most recent albums, which appeared to be hook-driven for catchiness' sake, the tracks on Emperor of Sand never feel cheapened by their infectious melodies; in fact its the polar opposite, as some of the catchiest bits of Emperor of Sand are also its most powerful. "Ancient Kingdom" and "Clandestiny" especially are examples of this. "Scorpion Breath," featuring the requisite appearance by Scott Kelly, is a solid track that doesn't do much with its guest, while album closer "Jaguar God" serves as a pensive, incredible denouement to this emotional album experience. There's no reason to bury the lede: Emperor of Sand is a fantastic album that wipes away any disappointment fans felt after their last two albums and falls just short of being Mastodon's fourth foray into the Classic Album Ledger. Maybe that's a little unfair, that the band is continually judged on their initial success, but it's the same reason anything other than a Super Bowl has been a disappointment to Tom Brady for the past fifteen years. My friend Noah, who introduced me to Mastodon way back in 2006, put it like this: "People hope to make ONE album like that in their lifetime, and they made three. It's impossible to recreate those classic albums; they're different people now. But this record is as close to those streaks of brilliance as it gets; if they only put out albums like this going forward, it will easily secure their place as a superhuman band in metal history." He's right. Emperor of Sand may not be Leviathan, Blood Mountain, or Crack the Skye, but it's a damn fine album in its own right, one that shows a band secure in who they are, performing as close to the pinnacle of their previous astronomically high success as humanly possible. I'll admit to being apprehensive before hearing it, but now it's official: Mastodon is back, and I couldn't be happier. Emperor of Sand is out tomorrow.